To attain the blessings of God, our Hindu philosophy advocates two paths, one of Bhakti (that of devotion), and the other of Gnana (that of wisdom). The path of wisdom considers the Almighty as a concept with out any form or any feeling etc., On the other hand the path of Bhakthi considers God as One, with or without a form, but as one who incorporates many divine feelings. Prarthana in other words means prayer or worship. Worship is the first route towards pursuing the Bhakti route for Godliness. The second step is Pooja. In other words, a specific form of worship which involves an offering of a material object, or the mind, or the body, or the soul to God. 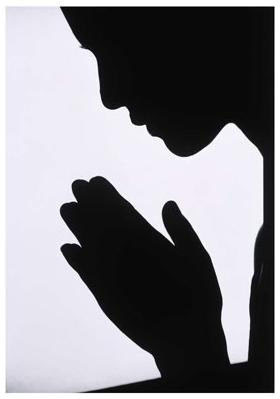 The word ‘prarthana (prayer)’ is derived from two words ‘pra’ and ‘artha’ meaning pleading fervently. In other words, it is asking The Lord for something with intense yearning. Prayer includes respect, love, pleading and faith. Through a prayer a devotee expresses his helplessness and endows the doer ship of the task to God. Prayer with expectation (sakam): This is done for fulfillment of worldly desires, e.g. wealth, progeny, worldly pleasures, etc. Prayer without expectation (nishkam): This prayer means surrendering oneself unto God or the Guru without any objective. A prayer made in the context of spiritual progress or the Guru’s mission is always of this type. 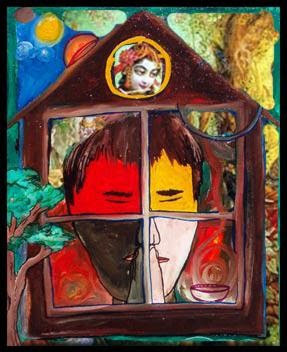 In the former, the one praying remains extroverted while in the latter, one becomes introverted. Prayer with expectation is inferior while that done without expectation is superior. Individual (vyashti) prayer and prayer for the sake of society (samashti): Individual prayer is one which is made to augment one’s individual spiritual practice. Initially a seeker should make this kind of prayer. Once the prayer occurs with spiritual emotion, the seeker can pray for other seekers and the society at large, e.g. for propagation of Righteousness (Dharma). This prayer is for the sake of society. Such a prayer inculcates expansiveness in a seeker. He begins to feel love for others and his spiritual practice for the sake of society is also augmented. A prayer will be just reciting some hymns or asking for blessings.They are religious practices, performed by people. The purpose of puja is to communicate with God. Puja literally means to “ worship “, “ adore “, “ honour “, or “ pay respect”. Puja is believed to be derived from the Dravidian (see Dasas) word 'pu-chey', (flower action) or worship with the offering of flowers. Some trace it to the Dravidian word 'pusu', to anoint or smear with sandalwood paste or vermilion. Many interpretations can be given in Hinduism to the word puja which consists of two letters, namely, "pa" and "ja". According to one interpretation, "pa" means "parayana" or continuous repetition of the names of God and "ja" means "japa" or continuous mental recitation of the names of God. 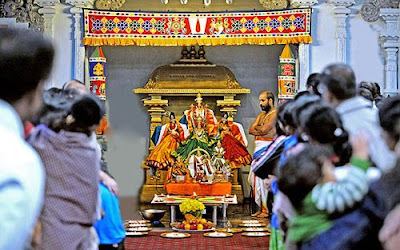 According to this interpretation "puja" is essentially a kind of Hindu worship in which both parayanam and japam are practiced by the devotees. In the puja ceremony, the Hindus offer both flowers and water to the deity. Thus from this point of view, "pu" means & "pushpam" or flower and "ja" means "jal". The letter "ja" can also mean simultaneously "japam". So in this context, puja becomes that form of Hindu worship, during which water and flowers are offered to God along with recitation of His names. Lastly, puja has a spiritual dimension also. According to this interpretation, puja means that form of worship through which we give birth to or awaken the indwelling spirit in us. Here & "pu" means "purusha", meaning the eternal self and "ja" means "janma", meaning to give birth to or to awaken. The term puja is now used to include all forms of ceremonial worship, ranging from the simple daily offerings of flowers, fruit, leaves, rice, sweetmeats and water to the deities in homes or temples. This rite is performed, in its bloodless form, by all pious Hindus at least once a day. Hindus commonly conduct pujas in shrines in three different environments: in temples, in the home, and in outdoor public spaces. It is equally common for any of the deities to be worshiped in any of these three types of shrines. Many Hindu homes have a personal shrine set aside somewhere in the house that include pictures or murtis of various deities. A daily puja is often performed that may also include offerings for the family's personal deity or religious. A daily Puja usually consists of a simple worship of offerings, such as an offering of light, water and incense, and/or fruit. Usually with a small aarti afterwards. Puja can be performed with any available offerings. A puja thali consists of a Diyaa/lamp, Haldi/Kumkum, Sweetmeats or fruits, Water, Bell, and Joss sticks. Aarti is usually performed with this offering afterward using an Aarti mantra. Temple pujas are more elaborate and typically done several times a day. They are also performed by a temple priest, or pujari. In addition, the temple deity is considered a resident rather than a guest, so the puja is modified to reflect that; for example the deity is "awakened" rather than "invoked" in the morning. Temple pujas vary widely from region to region and for different sects, with devotional hymns sung at Vaishnava temples for example. At a temple puja, there is often less active participation, with the priest acting on behalf of others. The object of the puja ritual is to create and setup thoughts of spiritual forces in and around us. This is best achieved by singing or chanting of some mantra, performing certain actions and making offerings in three defined stages. Each mantra is a magazine of vast spiritual forces. The importance of temples started growing because they became centers and mediums for communion with God. It becomes easy for a devotee to concentrate in worshiping God in a temple where hundreds of devotees come for the same purpose. The God must be approached with humility, without pride, tolerance, simplicity, self control, renunciation of the objects of sense gratification and steadiness. The environment of the temple produces a psychological effect which helps in concentrating on the desired objective. A temple is the place where a devotee tries to remain free from the perception of evil of birth, death old age, disease and entanglement with children, wife, home and the rest of the world. The main motive is to do worship and every other thing becomes unimportant. Hindus believe that if proper care is not taken of a temple's images, the deity will abandon the temple. Hence priests reside at the temple and take care of the gods' needs. Priests perform puja at sunrise, noon, sunset, and midnight. For a layperson, however, visiting a temple every day or even regularly is not mandatory, and many devout Hindus worship at home. The essential aspect of puja is not congregational worship but an individual's offering to a deity. Worship in the home usually takes place daily. 7 - Atma Puja - here you put sacred ash and kumkum on your own forehead and say the appropriate prayer. 10 - Avahanam (invitation) - this is where you invite the deity to come out of your heart and to enter into the sacred place. 15 - Abhishekam (bath). Here you bathe the murti. Again if you are using a photo or picture you only show the murti the water, but if it is a statue you actually bathe the statue. Then dry the statue. 16 - Vastram (dress) - here you dress the murti (or if using an photo or picture you simply sit this item(a piece of cloth) on to the altar. 17 - Upaveetam (sacred thread) - here you offer the sacred thread. 19 - Chandanam (sandalwood paste, kumkum, and vibhuti: sacred ash) - you place this on their forehead. Again if you don't have it you just offer flowers or a handful of rice or whatever it is you have to offer. The sandal paste reminds the devotee that he should, in his difficulties, be as patient as the sandal. Sandal emanates sweet odour when it is rubbed on a hard surface and made into a paste. So also the devotee should not murmur when difficulties arise, but on the other hand, remain cheerful and happy and emanate sweetness and gentleness like the sandal. He should not hate even his enemy. This is another precept we learn from this. Though the sandalwood is crushed and made into a paste, it silently wears out emanating only very sweet odour. One should not wish evil even to his enemy. 21 - Archana (names of the deity...whether 108 or 1000, depending on the deity) - here you recite the 108 (or 1000) names of the deity. If you have enough flowers you can offer a flower after each name. 22 - Dhupam (incense) - offer incense to the murti...this is done by waving incense sticks clockwise three times in fronto fthe face while ringing the bell. Dhupa or scented sticks are burnt before the Deity. The smoke spreads the whole room. It acts as a disinfectant. Burning of Dhupa denotes that the Lord is all-pervading and that He fills the whole universe by His living presence. It is to remind this fact that Dhupa is burnt. The devotee prays: - O Lord! Let the Vasanas and Samskaras dormant in me vanish like the smoke of this Dhupa and become ashes. Let me become stainless. 23 - Deepam (light) - wave the lamp three times in a clockwise motion while ringing the bell (you can do it more and sing/chant an aarti at this point, too). 25 - Tambulam (betel leaves and nuts) - you offer these if you have them. The betel leaf is symbolic of freshness and prosperity. The Skanda Purana says that the betel leaf was obtained by Gods during the grand ocean-churning. 26 - Karpura Nirajanam (camphor flame) - here you light the camphor flame and wave it three times clockwise before the deity while ringing the bell (if you have it, if not you can just wave the lamp again). 27 - Mantra Pushpam (flowers with praises) - this is the fun part of puja (in my humble opinion) here you offer praise to the deity and upon the end of the praise prayer you then throw up the flowers so that they shower down upon the deity and the altar. If you don't have flowers I've been told rice works well, too. 31 - Pardoning - this is a simple prayer asking for forgiveness for any mistakes you may have made during the puja.